Mojtahedzadeh, M., Etezadi, F., Motaharinia, J., Abdollahi, A., Mehrsai, A., Ziaie, S., Saadat, S. (2016). Predictive Values of Urinary Interleukin 18 and Neutrophil Gelatinase-Associated Lipocalin for Delayed Graft Function Diagnosis in Kidney Transplantation. Iranian Journal of Pathology, 11(4), 391-398. Mojtaba Mojtahedzadeh; Farhad Etezadi; Javad Motaharinia; Alireza Abdollahi; Abdorasul Mehrsai; Shadi Ziaie; Soheil Saadat. "Predictive Values of Urinary Interleukin 18 and Neutrophil Gelatinase-Associated Lipocalin for Delayed Graft Function Diagnosis in Kidney Transplantation". 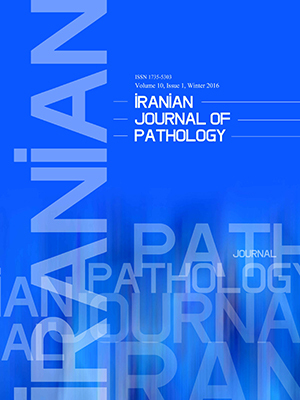 Iranian Journal of Pathology, 11, 4, 2016, 391-398. Mojtahedzadeh, M., Etezadi, F., Motaharinia, J., Abdollahi, A., Mehrsai, A., Ziaie, S., Saadat, S. (2016). 'Predictive Values of Urinary Interleukin 18 and Neutrophil Gelatinase-Associated Lipocalin for Delayed Graft Function Diagnosis in Kidney Transplantation', Iranian Journal of Pathology, 11(4), pp. 391-398. Mojtahedzadeh, M., Etezadi, F., Motaharinia, J., Abdollahi, A., Mehrsai, A., Ziaie, S., Saadat, S. Predictive Values of Urinary Interleukin 18 and Neutrophil Gelatinase-Associated Lipocalin for Delayed Graft Function Diagnosis in Kidney Transplantation. Iranian Journal of Pathology, 2016; 11(4): 391-398. 3Valiasr Hospital, Tehran University of Medical Sciences, Tehran, Iran. Background: Delayed graft function is a main complication after deceased donor kidney transplantation that adversely affects graft outcome. Difficulties in prediction and early detection of delayed graft function have hindered the ability to perform proper therapeutic interventions. We investigated whether measuring urinary interleukin 18 and neutrophil gelatinase-associated lipocalin as markers of ischemia reperfusion injury could predict delayed graft function in deceased donor kidney transplant patients. Methods: We studied 69 patients undergoing kidney transplantation from deceased donor during early October 2013 to December 2014 at the Urology Research Center, Sina Hospital, Tehran University of Medical Sciences, Tehran, Iran. Serial urine samples at 2, 24, and 48 h after transplantation were analyzed for interleukin 18 and neutrophil gelatinase-associated lipocalin levels. Results: Thirteen patients (18.9%) developed delayed graft function. Urine interleukin 18 to urine creatinine ratio was significantly higher in patients with delayed graft function compared to those with non-delayed graft function, at 2 (P=0.003), 24 (P<0.001) and 48 h (P=0.018) points. The levels of neutrophil gelatinase-associated lipocalin to urine creatinine ratio were significantly higher in the group with delayed graft function at the 24 (P=0.004) and 48 h (P=0.015) points. The receiver–operating characteristic curve analysis suggested that both urinary biomarkers at 24 h after transplantation had better accuracies for prediction of delayed graft function. In multivariate analysis, only urinary interleukin 18 to urine creatinine ratio improved the ability of clinical model for predicting delayed graft function. Conclusion: Urinary interleukin 18 to urine creatinine ratio at 24 h post-transplantation, along with traditional markers such as relative fall in serum creatinine, urine output and other risk factors for delayed graft function, increased the ability to predict delayed graft function. Ojo AO, Wolfe RA, Held PJ, Port FK, Schmouder RL. Delayed graft function: risk factors and implications for renal allograft survival. Transplantation 1997;63(7):968-74. Menke J, Sollinger D, Schamberger B, Heemann U, Lutz J. The effect of ischemia/reperfusion on the kidney graft. Curr Opin Organ Transplant 2014;19(4):395-400. Schroppel B, Legendre C. Delayed kidney graft function: from mechanism to translation. Kidney Int 2014;86(2):251-8. Chapal M, Le Borgne F, Legendre C, Kreis H, Mourad G, Garrigue V, et al. A useful scoring system for the prediction and management of delayed graft function following kidney transplantation from cadaveric donors. Kidney Int 2014;86(6):1130-9. Alachkar N, Rabb H, Jaar BG. Urinary biomarkers in acute kidney transplant dysfunction. Nephron Clin Pract 2011;118(2):c173-81; discussion c81. Halawa A. The early diagnosis of acute renal graft dysfunction: a challenge we face. The role of novel biomarkers. Ann Transplant 2011;16(1):90-8. Cecka JM, Terasaki PI. The UNOS scientific renal transplant registry. United Network for Organ Sharing. Clin Transpl 1995:1-18. Fattahi MR, Nourballa MH, Rostami Z, Einollahi B. Patient and graft outcomes in deceased-donor kidney transplantation: a good start for a promising future. Iran J Kidney Dis 2012;6(4):291-4. Kanter J, Beltran S, Molina D, Vallecillo J, Sancho A, Gavela E, et al. Urinary neutrophil gelatinase-associated lipocalin after kidney transplantation: is it a good biomarker to assess delayed graft function? Transplant Proc 2013;45(4):1368-70. Pajek J, Skoberne A, Sosteric K, Adlesic B, Leskosek B, Bucar Pajek M, et al. Non-inferiority of creatinine excretion rate to urinary L-FABP and NGAL as predictors of early renal allograft function. BMC Nephrol.2014;15:117. Hollmen ME, Kyllonen LE, Inkinen KA, Lalla ML, Salmela KT. Urine neutrophil gelatinase-associated lipocalin is a marker of graft recovery after kidney transplantation. Kidney Int 2011;79(1):89-98. Hall IE, Yarlagadda SG, Coca SG, Wang Z, Doshi M, Devarajan P, et al. IL-18 and urinary NGAL predict dialysis and graft recovery after kidney transplantation. J Am Soc Nephrol 2010;21(1):189-97. Parikh CR, Jani A, Mishra J, Ma Q, Kelly C, Barasch J, et al. Urine NGAL and IL-18 are predictive biomarkers for delayed graft function following kidney transplantation. Am J Transplant 2006;6(7):1639-45. Qurashi S, Ghamdi G, Jaradat M, Tamim H, Aljumah A, Tamimi W, et al. Urinary neutrophil gelatinase-associated lipocalin and the occurrence of delayed graft function after kidney transplant. Exp Clin Transplant 2014;12(5):396-400. Siew ED, Ware LB, Ikizler TA. Biological markers of acute kidney injury. J Am Soc Nephrol 2011;22(5):810-20. Pianta TJ, Peake PW, Pickering JW, Kelleher M, Buckley NA, Endre ZH. Clusterin in kidney transplantation: novel biomarkers versus serum creatinine for early prediction of delayed graft function. Transplantation 2015;99(1):171-9.